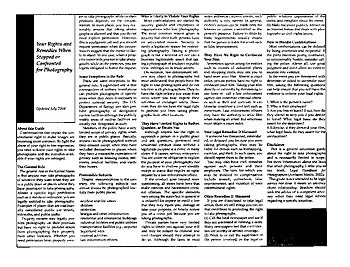 The Photographer’s Right is a one-page printout on what the rights of photographers are when shooting in public places. It is loosely based on the Bust Card and the Know Your Rights pamphlet that was once available on the ACLU website. It may be downloaded and printed out using Adobe Acrobat Reader. You may make copies and carry them your wallet, pocket, or camera bag to give you quick access to your rights and obligations concerning confrontations over photography. You may distribute the guide to others, provided that such distribution is not done for commercial gain and credit is given to the author, Bert Krages 2nd, who is an attorney. • What is off-limits to a documentary filmmaker?